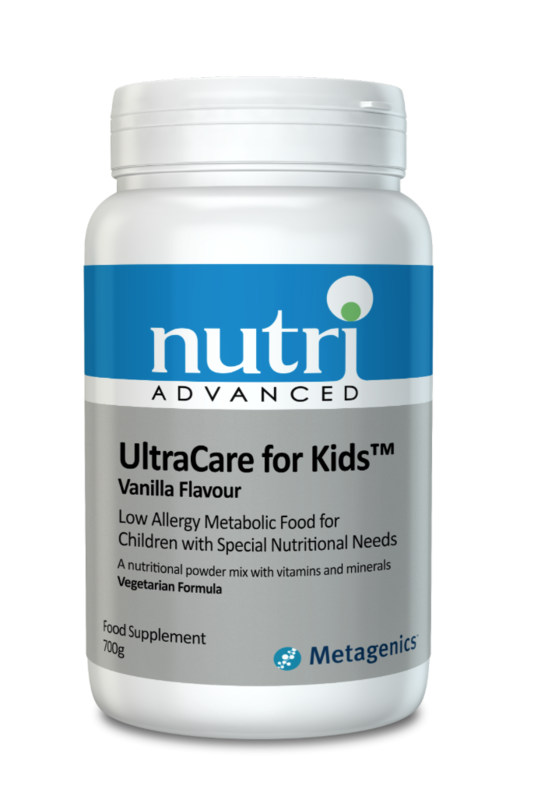 UltraCare for Kids™ is a speciality powdered mix designed to support children whose diet is restricted due to food sensitivities or just plain fussiness. Provides an excellent source of high quality protein and easily digested carbohydrates, as well as vitamins and minerals. Provides a great macro- and micro-nutrient base formula with additional alkalising support. Provides dairy-free calcium - 250mg per serving. Calcium is needed for the maintenance of bone health. When combined with the accompanying diet plan, provides high quality nutrition for children under 12 years of age. Comes with a Parents’ Guide for Use for complete programme guidelines. Delicious, child-tested and approved Vanilla flavour. Ideal for children with food sensitivities or fussy eaters who struggle to obtain a balanced diet. Add two level scoops (30g) to 8-10 ounces of pure, distilled, or filtered water. Blend, shake, or briskly stir until powder is completely dissolved. Not intended as an infant formula. Do not use as a sole source of nutrition. This product is to be used under the direct supervision of a healthcare practitioner. Suitable for children aged 1 to 12 years. Do not exceed 750µg of vitamin A (as retinol) per day if pregnant or likely to become pregnant except on the advice of a doctor or antenatal clinic.